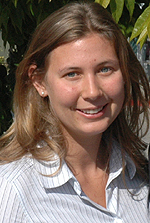 Allison Abresch-Meyer will get some welcome assistance paying her medical school bills thanks to a new scholarship established by the Sutter Maternity & Surgery Center and the Central Coast Alliance for Health to benefit graduates of the health sciences program at the University of California, Santa Cruz. Abresch-Meyer, who graduated from UCSC in December 2006, is the first recipient of the Primary Care Physician Award sponsored by Sutter Maternity & Surgery Center and Central Coast Alliance for Health (CCAH). The $10,000 award is meant to support a student who plans to focus on primary care medicine and intends to come back to the Central Coast to practice. "Strong primary care corresponds to better health outcomes at lower cost, and I would like to be a part of this process in an area of California that I have come to love," said Abresch-Meyer. The shortage of primary care physicians is a growing national problem that is exacerbated in areas such as the Central Coast by low Medicare reimbursement rates, said Larry deGhetaldi, CEO of Sutter Santa Cruz. Abresch-Meyer's selection for the award was announced at a meeting Thursday (May 31) at which Rep. Sam Farr briefed deGhetaldi and other regional health care leaders on a bill he has introduced to fix inequities in Medicare reimbursement rates. In congratulating Abresch-Meyer, Farr noted that the difficulty of attracting and retaining doctors in this area makes it especially important to encourage students already in the community to pursue careers in health care. DeGhetaldi, a UCSC alumnus and a UCSC Foundation trustee, noted that about 10 percent of the doctors in Santa Cruz County are UCSC alumni. Alan McKay, executive director of CCAH, is also a UCSC alumnus. "We want to encourage UCSC as a feeder for medical schools, because a lot of those doctors come back and practice in this region," deGhetaldi said. "This award is really a symbolic scholarship that honors the role of primary care physicians and recognizes the creation of a comprehensive and innovative health sciences program at UCSC." Established in 2003, UCSC's health sciences program is the campus's fastest growing major and is already one of the most popular, said Grant Hartzog, an associate professor of molecular, cell, and developmental biology who has been involved in creating and overseeing the program. The program is administered by the Department of Molecular, Cell, and Developmental Biology. "We have gone from zero to nearly 600 students in the major in less than four years, and it is drawing in people who are likely to come back and serve the Monterey Bay region," Hartzog said. "We have also found that in terms of ethnicity and economic background, this major is more diverse than the campus population as a whole." With requirements such as Spanish-language courses and community internships, the program was designed to help meet the needs of California for well-trained health care practitioners. "California is not training enough doctors to meet our needs, and the whole UC system needs to address that," deGhetaldi said. "I was particularly pleased to see the Spanish-language component in UCSC's program. If you're training future doctors for California, that's a no-brainer." Abresch-Meyer is fluent in Spanish as a result of the Spanish immersion program in her elementary school. She has served as a translator for Spanish patients at the UC Davis Medical Center and as an HIV Test Counselor at UCSC. A Certified Massage Therapist, she operated her own massage business throughout college. She was accepted by five medical schools, but she has not made a final decision yet and has deferred enrollment until 2008. Funded by a gift to UCSC from Sutter Maternity & Surgery Center, the Sutter Maternity & Surgery Center/Central Coast Alliance for Health Primary Care Physician Award is intended to benefit the mission of CCAH to provide quality primary care to Medi-Cal recipients in the Central Coast region. CCAH is a nonprofit health plan that serves more than 85,000 members in Santa Cruz and Monterey Counties and works to improve access to health care for lower-income residents. For more information about UCSC's health sciences program, contact Grant Hartzog at (831) 459-5826 or hartzog@biology.ucsc.edu, or Caroline Berger at (831) 459-5647 or cmberger@ucsc.edu.